The 2010 MINI Cooper Base three-door hatchback combines one-of-a-kind styling and a sporty driving dynamic with a fuel-efficient engine and a well-equipped, though compact, cabin. Standard interior features for 2010 include leatherette upholstery with six-way manually adjustable front seats and a tilt/telescopic steering column. The leather-wrapped sport steering wheel comes equipped with audio and cruise controls. Air conditioning, a start/stop button, and a climate-controlled glove box also come standard. Tech features include an onboard computer, which displays trip information, and a six-speaker AM/FM audio system with a CD player and an MP3 input jack. An optional Mayfair package, new for 2010, adds toffee-colored leather upholstery, matching interior trim, front driving lamps, and Hot Chocolate exterior paint with toffee-colored racing stripes on the hood, while the Camden package, also new, adds leather sport seats, silver lining on interior surfaces, a Harman Kardon sound system, and White Silver exterior paint. A 1.6-liter four-cylinder engine powers the MINI Cooper Base. The engine produces 118 hp and 114 lb-ft of torque, and links to either a Getrag six-speed manual transmission or an optional six-speed Aisin automatic. The EPA estimates fuel economy at 28/37 mpg. Standard safety features include six airbags, Dynamic Stability Control, and antilock brakes with electronic brakeforce distribution. The Cooper Base rides on 15-inch alloy wheels, which come standard, while the Mayfair and Camden packages add unique 17-inch wheels. The 2010 MINI Cooper S three-door hatchback comes equipped with a number of features not found on the Cooper Base trim, as well as a sportier suspension and a more powerful engine. The Cooper S trim's expanded feature list includes sport seats, aluminum-alloy foot pedals, a hood scoop, dual chrome tailpipes, and a chrome fuel cap. Leatherette upholstery comes standard throughout the cabin, while the front seats feature six-way manual adjustment. A leather-wrapped sport steering wheel, a tilt/telescopic steering column, cruise control, air conditioning, a start/stop button, and a six-speaker AM/FM audio system with a CD player and an MP3 input jack also come standard. An optional Mayfair package, new for 2010, adds such features as toffee-colored leather seats with matching interior surfaces and Hot Chocolate exterior paint, while the optional Camden package, also new, includes such upgrades as black or white leather upholstery, a Harman Kardon audio system, Bluetooth, Sirius satellite radio, and White Silver exterior paint. Power comes in the form of a turbocharged, direct injection 1.6-liter four-cylinder engine developing 172 hp and 177 lb-ft of torque. The turbocharged powerplant links to either a Getrag six-speed manual transmission, which comes standard, or an optional six-speed Aisin automatic with steering-wheel-mounted paddle shifters for manual shifting. Fuel economy numbers check in at 26/34 mpg. The MINI Cooper S rides on an upgraded sport suspension with stiffer shocks and springs than the Base trim's. Six airbags, including side-seat and side-curtain airbags, come standard. Other safety features include Dynamic Stability Control and antilock brakes with electronic brakeforce distribution. 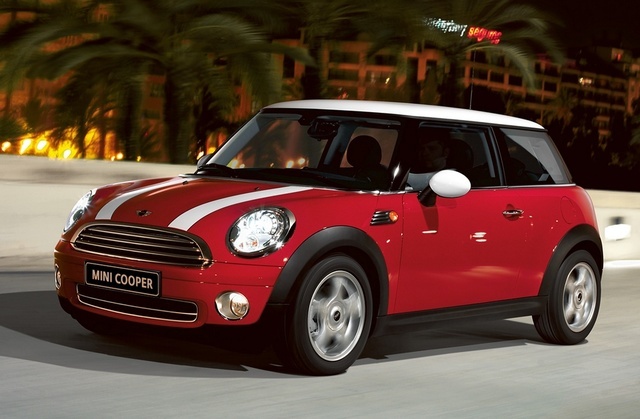 The MINI Cooper S rides on 16-inch alloy wheels with an S-Winder design. The optional Mayfair and Camden packages add unique 17-inch wheels. The two-door 2010 MINI Cooper Base Convertible features a power-operated fabric top that retracts in 15 seconds. In addition, drivers can partially open the top to create a sunroof. Standard exterior features include a chrome grille, sport bumpers, open-wide doors, and a trunk opening designed for easy-load access. The convertible's 1.6-liter four-cylinder engine develops 118 hp and 114 lb-ft of torque. It posts fuel economy numbers of 28/36 mpg, and links to either a Getrag six-speed manual transmission or an optional six-speed Aisin automatic. Standard interior features for the 2010 MINI Cooper Base Convertible include leatherette upholstery, six-way manually adjustable front seats, and a tilt/telescopic steering column with a leather-wrapped sport steering wheel. Cruise control, air conditioning, a start/stop button, a climate-controlled glove box, and a six-speaker AM/FM audio system with a CD player and an MP3 input jack also come standard. An onboard computer displays trip information, average speed, fuel consumption, and outside temperature. Options include leather upholstery, heated front seats, a navigation system, and a Harman Kardon audio system. The Cooper Base Convertible rides on 15-inch alloy wheels. The 2010 MINI Cooper S Convertible combines sporty open-air driving with a fuel-efficient powerplant and a well-equipped interior. The convertible's power-operated fabric top opens in 15 seconds and stores in a compact space above the trunk. The top includes a heated glass rear window. Inside, standard features for the Cooper S Convertible include leatherette upholstery, six-way manually adjustable front sport seats, and a tilt/telescopic steering column with a leather-wrapped sport steering wheel. Air conditioning, aluminum-alloy foot pedals, a tilt/telescopic steering column, a start/stop button, and a six-speaker AM/FM audio system with a CD player and an MP3 input jack also come standard. Six airbags, including side-seat and side-curtain airbags, provide protection for passengers. A turbocharged, direct injection 1.6-liter four-cylinder engine producing 172 hp and 177 lb-ft of torque drives the 2010 MINI Cooper S Convertible. The turbocharged engine mates to either a Getrag six-speed manual transmission, which comes standard, or an optional six-speed Aisin automatic with steering-wheel-mounted paddle shifters for manual shifting. The powerplant posts fuel economy numbers of 26/34 mpg. The Cooper S rides on a beefed-up suspension with stiffer shocks and springs than the Base convertible's. Standard safety features include Dynamic Stability Control and antilock brakes with electronic brakeforce distribution. The MINI Cooper S rides on 16-inch alloy wheels. The 2010 MINI Cooper John Cooper Works two-door hatchback trim provides a fast, fun ride, thanks to a sport-tuned suspension and a turbocharged, performance-tweaked 1.6-liter four-cylinder engine. The engine features a Borg Warner turbocharger and modified cylinders and exhaust tuning, resulting in 208 hp and 207 lb-ft of peak torque. MINI offers only a six-speed manual transmission with a short-throw shifter on this trim, due to its sporty nature. The powerplant drives the John Cooper Works trim from 0-60 in 6.2 seconds, with a top speed of 148 mph. The sporty hatchback rides on a beefed-up performance suspension with sport-tuned shocks and springs, and sits slightly lower than the other MINI Cooper trims, resulting in a lower center of gravity, improved handling, and better performance dynamics. Brembo front brakes with 12.4-inch brake discs provide plenty of stopping power. Inside, the John Cooper Works trim comes equipped with such standard features as cloth upholstery, six-way manually adjustable front sport seats, and a tilt/telescopic steering column with a leather-wrapped sport steering wheel. Air conditioning, aluminum-alloy foot pedals, keyless entry, a start/stop button, a climate-controlled glovebox, and a six-speaker AM/FM audio system with a CD player and an MP3 input jack also come standard. Safety features include six airbags, Dynamic Stability Control, traction control, and antilock brakes with electronic brakeforce distribution. The John Cooper Works trim rides on 17-inch alloy wheels with run-flat tires. The 2010 MINI Cooper John Cooper Works Convertible delivers impressive performance, a sporty ride, and an open-air driving experience, thanks to its power-operated fabric top, which opens in 15 seconds and stores in a compact space above the trunk. The top includes a heated glass rear window. Inside, standard features for the John Cooper Works Convertible include cloth upholstery, six-way manually adjustable front sport seats, and a tilt/telescopic steering column with a leather-wrapped sport steering wheel. Aluminum-alloy foot pedals, keyless entry, a start/stop button, air conditioning, a climate-controlled glovebox, and a six-speaker AM/FM audio system with a CD player and an MP3 input jack also come standard. Owners can add such features as leather upholstery, heated front seats, and a navigation system with real-time traffic. A turbocharged, performance-tweaked 1.6-liter four-cylinder engine drives the 2010 MINI Cooper John Cooper Works Convertible. The engine develops 208 hp and 207 lb-ft of peak torque, thanks to its Borg Warner turbocharger and modified cylinders and exhaust tuning. It links to a six-speed manual transmission with a short-throw shifter, which is the only transmission available on this trim. The engine propels the two-door convertible from 0-60 in 6.2 seconds, with a top speed of 148 mph. A beefed-up performance suspension with sport-tuned shocks and springs provides a sporty ride. In addition, the convertible sits slightly lower than the other MINI Cooper trims, resulting in a lower center of gravity, improved handling, and better performance dynamics. Brembo front brakes with 12.4-inch brake discs provide plenty of stopping power. Safety features include six airbags, Dynamic Stability Control, traction control, and antilock brakes with electronic brakeforce distribution. The John Cooper Works Convertible trim rides on 17-inch alloy wheels with run-flat tires.